An ugly housing number… clearing up some reader confusion… the Texas Bullion Depository gets curiouser and curiouser… and more! We’re not sure what it means when a $31 billion American company gets a better reception in Havana than it does in New York. As you might be aware, the president is in Miami today — playing to the aging but still-powerful Cuban exile lobby by announcing he’ll roll back some of his predecessor’s measures that opened up Cuba to U.S. investment. Among the companies that have benefited from that opening is Airbnb — the privately held outfit that links travelers with people willing to rent a spare room in their homes. To say nothing of introducing everyday Cubans to the joys of free enterprise. In contrast, Airbnb and other “roomsharing” services were banned in New York state last year. Lawmakers caved to lobbying pressure from the hotel chains and hotel unions, which don’t care for the competition. New Yorkers are flouting the law in immense numbers; as we mentioned back in January, Airbnb says it booked 55,000 New Year’s Eve rentals in the Big Apple — up from the previous year’s total when the ban wasn’t yet in place. 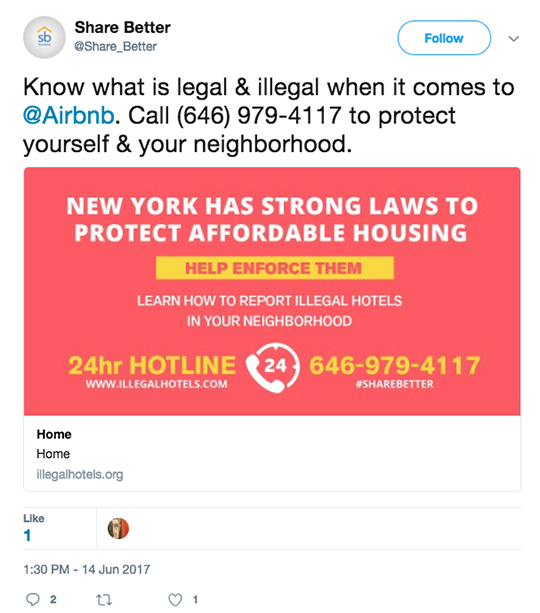 Now we see the hotel industry is fighting back… by encouraging New Yorkers to snitch on their neighbors. To the markets, where a blockbuster merger announcement is turning retail upside-down. Amazon is buying Whole Foods for $13.7 billion. Whole Foods has been in trouble for a while. Founder John Mackey had an innovative business model and a unique market niche — in the 1990s and early 2000s. But ordinary grocers have been muscling in on the organic space with considerable success. In recent months, the “activist investor” Jana Partners scooped up 8% of WFM shares and began demanding changes to the business model and the board of directors. “Greedy bastards,” Mackey called them this week in an interview with Texas Monthly. He accused them of looking to make a fast buck by pushing WFM to sell out. Amazon’s gambit is sending shudders through the grocery industry. Kroger is down 13% as we write. Big-box retailers that include groceries in their mix are hurting too; Target is down 9% and Wal-Mart is down 6%. The Street chatter is that WMT might feel compelled to step up with its own offer for Whole Foods. And Amazon? It’s up 3%. None of this retail action is having a major effect on the stock market as a whole; the major U.S. indexes are in the red, but not dramatically. Gold is quiet, the bid $1,255. The big economic number of the day is another big disappointment. Housing starts tumbled 5.5% in May, on top of a weak April number. Permits — a more reliable indicator of future activity — also missed expectations big-time, down 4.9%. Which makes this week’s moves by the Federal Reserve even more staggering in Jim’s mind. Not the part about the interest rate increase; everyone had priced that in for months. It was the blithe dismissal of all the lousy economic data. “They dismissed recent disinflationary trends as ‘transitory,’” says Jim. “That’s the Fed’s favorite word when the data don’t fit their thesis. The Fed also saw strength based on job creation and a low unemployment rate — which totally ignores declining productivity and labor force participation. 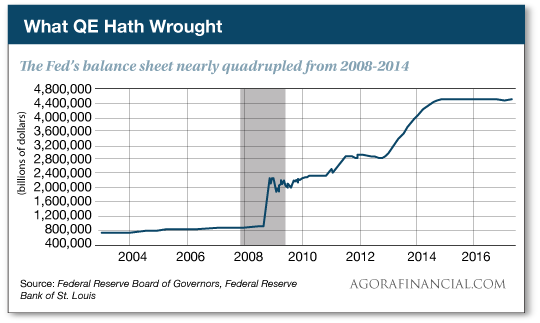 This is the Fed’s effort to reverse “quantitative easing,” or QE, and reduce its bloated balance sheet, which blew up fivefold in the six years after the Panic of 2008. We already knew the rough outlines of this plan: As some of the bonds owned by the Fed reached maturity, the Fed would opt not to roll them over into new bonds. But on Wednesday, the Fed put specific numbers to it: $6 billion in Treasuries and $4 billion in mortgages each month, starting sometime around September. Every three months, those numbers would increase until the pace reaches $30 billion in Treasuries and $20 billion in mortgages each month by the end of next year — shrinking the balance sheet from $4.5 trillion to about $2.5 trillion. Jim says this is a major miscalculation along the lines of “QE2” in 2010–2011. “The win rate was so high, I had to run the data twice!” says one of our trading specialists, Jonas Elmerraji. Since Wednesday we’ve been telling you about the “Kinetic Composite” he’s developed. Using 20 years of data, this metric tells you the ideal times of year to buy and sell. You can apply it to an index like the S&P 500… or an ETF… or an individual stock. The Kinetic Composite identifies when a stock is most likely to be in motion — hence the “Kinetic” part of the name. In the case of the S&P 500, the adage about “Sell in May and go away” really holds true. By staying out of the S&P from May 2 till Oct. 1, you can beat the S&P by an average 24% a year. But how can Jonas line up the dates with such precision? Jonas’ next challenge was to find a way to sort through the thousands of stocks out there to identify the most powerful K-Signs with the biggest profit potential. Using an inordinate amount of computer processing power — let’s just say Agora Financial’s cooling bills are a lot higher now than they were a year ago — Jonas’ algorithm zeroed in on a single metric that ferrets out the best-of-the-best K-Signs. The win rate becomes a staggering 93.5%. “I didn’t believe the data the first time,” says Jonas — which is why he ran it a second time. He got the same result. If you’re starting to get the idea that Jonas has developed a revolutionary trading system that can dramatically improve your performance… you’re absolutely right. We’ll pull back the veil still more next week… and then we’ll show you how to take advantage of the Kinetic Composite’s power to secure your retirement and help you live the lifestyle of your dreams. It’s exciting times around here… so be sure to check in with The 5 next week. “Frustrated,” begins today’s mailbag, from someone we assume is a new reader. Says another that came in this week, from a new subscriber to True Alpha: “I signed up for this service for recommendations, not a constant sales pitch for all kinds of other information that you are supposed to be providing. When is this going to start? The 5: Our readership keeps growing, so I guess we’re not surprised to see an uptick in these complaints. To be clear: The newsletter subscription you signed up for has a monthly issue with investment recommendations, along with weekly updates. The 5 is a free bonus to your subscription, a window into the work of our other editors. We aim for you to learn something new every day, whether or not you choose to sign up for a subscription to another of our publications. Early last month, we had a tutorial of sorts for newer readers — to make sure everyone knows how to access the information they’ve paid for. If you missed it then, here’s a link to it again. Ah, yes, that’s a puzzler. As we said yesterday, the whole idea was to “bring the gold home” and store the endowment’s considerable gold holdings in the Lone Star State. “Correct me if I am wrong,” the reader goes on, “but isn’t Comex one of those platforms that has issued paper gold at the rate of approximately 100 ounces for each real, tangible ounce on deposit? The 5: The whole thing is getting weird. The news coverage this week indicates that all along, UT endowment managers have said the gold would be moved to Texas only if the new depository is a full member of the Comex. But Matt Ferris, chairman of Lone Star Tangible Assets — the contractor chosen this week to run the depository — says Comex rules require all its members to be located within 150 miles of New York state. P.S. Last chance: Jim Rickards’ extraordinary “double gold” offer — closes tonight at midnight. What’s “double gold” all about? Click here for the details — no long video to watch.